UFO blitzes have been reported in many places around the world, from Fall 2006 to the present. A Moscow resident recently reported to me via email that they too have had a blitz. At about 18:00 I glanced through my window and saw a bright unmoving spot of light (object) in the sky above Maryino district. The object stood in one place for some time, than disappeared and reappeared in other place, not far from the original. Soon, another object appeared not far from the first one, and approached it. Two objects merged and disappeared. Soon after, three objects appeared one by one. They repeatedly appear, hang in place, move, merge, spread apart and disappear. All that actions happened slowly, on a relatively small area, about 10-15 degrees above the horizon. At about 19:00 two objects approached each other, merged, than continued their movement in opposite directions. The third similar object appeared beside them. Three objects formed a triangle. Slowly, triangle started to spin. Original photos taken in 2304?1728 resolution, video clips recorded in 320?200, 30 fps. Is this related to pending Earth changes for the region, as the Zeta reported was the case for Hawaii and the Carolinas and London and Istanbul? ZetaTalk Answer 3/17/2007: The UFO blitz of recent months included more reports than reached the media in the US. As can be shown by this excellent report, Moscow was given a light show and telepathic warning too. If UFO's were seen across the US and in Istambul and London, as warnings, what is in store in Moscow, in the coming months? Moscow is in the center of an extreme stretch of lowlands. Where above sea level now, after the pole shift, when the big melt has raised the sea level some 675 feet worldwide, Moscow residents will have hundreds of miles to traverse in order to be above the waves. There are no foot hills, no mountains, no plateaus, in any direction. To the East, the Urals. To the Southeast, the Caucasus. To the Southwest, the Carpacians. And to the Northwest, beyond Finland, the mountains of Sweden. We have described the UFO blitz in Istanbul, Turkey as a warning that the entry to the Black Sea will lower as Africa twists during pre-shift quakes and plate movements. Where does this water go? There are several rivers that drain these lowlands, many ending in the vicinity of Moscow. The waters go up river, pushed back, a backwash. Moscow will be reminded early that it lies in lowlands, with unexpected flooding a result of plate adjustments. And indeed, Russia is experiencing Earth change. A disastrous mining accident has taken 75 lives in southwestern Siberia. At least 75 miners are dead, a number that could rise, and at least 43 are missing after a methane gas explosion at a coal mine in southwestern Siberia. The ministry said 84 miners have been rescued. The mine operated with new equipment. Is this a result of Earth movement, releasing methane gas? The deepest fresh water lake in the world, Lake Baikal, lies in southeastern Siberia. It appears there are rifts in the great Asian plate, and this plate also has its stretch zone! ZetaTalk Answer 3/24/07: From the Black Sea to the Caspian Sea to the Aral Sea to Lake Balkhash in Kaszkhstan over to Lake Baikal in Russia, there is evidence of stretching and ripping above the mountains of Turkey and Iran and Tibet. The Mediterranean itself gives evidence that the great Asian plate is being stretched, as the Mediterranean was once a swamp, not a sea. Certainly, stretching is occurring below this line, the African Rift Valley and Red Sea giving evidence of this. We have stated that during the pole shift, a seaway will appear in Pakistan, ripping up to above Tibet. Such are the forces that are stretching land while the great Pacific is forced to compress. Was the mining accident in the stretch zone of Russia caused by earth movement? Equipment was new, the mine expected to be among the safest in Russia. When land is stretched, rock layers pull apart, releasing trapped vegetation and methane pools. Indeed, during the coming months, mining will become an even more dangerous occupation! Mining accidents have happened in the N American continent, similarly, due to Earth movements. Within a 4 week period in 2006, mining accidents from Canada to Mexico occurred. The first was in the Sago mine in West Virginia, then another in Ontario, Canada (which has an impeccable safety record), followed by a rare disaster in Mexico. 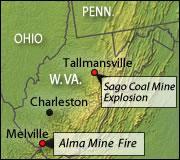 The United Mine Workers of America tomorrow will issue its report on the January 2006 disaster at West Virginia's Sago Mine. The state of West Virginia has already issued two Sago reports, both citing a lightning strike as the probable cause for the methane explosion, although neither could pinpoint how the lightning reached the sealed area underground. Rescue workers were burrowing through debris clogging a Mexican coal mine early Monday in a desperate effort to reach some 65 miners who were trapped for more than a day by a gas explosion. A federal labor official told reporters during a news conference at the site that officials found nothing unusual during a routine evaluation on Feb. 7. Last month, 14 miners died in two separate accidents at mines in West Virginia, in the United States. In Canada last month, 72 potash miners walked away from an underground fire and toxic smoke. For the N American continent, the Zetas have pointed out the relationship to the diagonal pull the continent is under. The mining accidents in early 2006 were along a diagonal line from New England to Mexico. This is also the line of the funky methane gas smells on Jan 8, 2007 when New York City was frantic from suspected gas leaks, and similar gas smells were detected acoss the continent from Memphis, TN down to Austin, TX where dead birds suddenly appeared. ZetaTalk Explanation 1/9/2007: Look at these Earth fart incidences, occurring on Jan 8, 2007. New York City, across to Ohio and Nashville and Missouri and Texas. Does this not line up with the mining accidents following the Sago Mine incident in late 2005? From New England to Mexico, that line. This is where the ground is being pulled, diagonally, with land West of the Mississippi going Southwest, land East of the Mississippi going Northeast. Such a diagonal pull certainly exposes rotting vegetation trapped between rock layers to the air. Weather swings were predicted by the Zetas in 1995, to increase steadily as we approached the pole shift. The Zetas, and only the Zetas, were predicting the swings we have today. ZetaTalk Prediction 7/15/1995: All attempts to explain the changes based on Global Warming from the Greenhouse effect will run into snags as the weather will refuse to be predictable. Temperate climates used to periodic gentle rainfall will suffer intractable droughts. Violent storms, unusual weather patterns, severe and long lasting droughts, increased frequency of hurricanes, torrential rains, and a general warming of the planet. This warning included temperature extremes, to the point where the seasons will blend into one another. ZetaTalk Warning 7/29/2005: Has the lineal increase we predicted in 1995 reached its climax? We are not here with good tidings, nor were we here with good tidings in 1995. ZetaTalk, blunt and honest, is not for the faint at heart, but for those willing to take a serious warning and act on it. Temperature extremes, and in particular temperature swings, will increase, so that the seasons almost blend into one another. If Summer is expected to be a time of extreme heat, and Winter extreme cold, man may find his Summer cool with odd brief snowstorms and Winter confusing the crops wanting to go into their annual hibernation. The key will be the unpredictability, as a looping jet stream and increasing extremes of high and low pressure over land will force the atmosphere into unexpected directions. We are steadily moving in this direction. Europe had an exceptionally mild Winter, without snowfall in many places, and just as Winter ended and Spring began, the snow started falling! In Slovenia, Winter time is by law between Nov 15 - Mar 15. During that time, cars must be equipped with winter tires. We did not have a single snowflake during this time, so many people mounted Summer tires on their cars in the past days. As soon as Mar 15 passed it started to snow! After record cold in many parts of the US, Spring emerged with record heat! For the fifth consecutive day, the mercury sweated out another record high temperature. It was 94 degrees Sunday, breaking the old record for the date of 91 degrees set in 2004. Sunday morning's low of 65 degrees also established a record for the warmest minimum temperature for the date, breaking the old mark of 62 set in 2004. And on yet another part of the globe, S Africa, severe and unexplainable storms are emerging. South Africa - Thursday night's savage storm has even the Durban Weather Office baffled as to its origin. We normally experience storms like this in the late afternoon but, for some reason, in the past week we've had two wild and volatile storms occur in the middle of the night. There are usually three scenarios under which such storms occur, which are generally caused by a convergence between two flows of air, but this does not apply here. South Africa - Durban hospitals are filling up with storm victims as rescue and emergency services prepared for the mother of all storms. We are mobilising every resource, from surf rescue helicopters to available ambulances and even off-duty personnel. What might we expect next, other than more of the same? ZetaTalk Answer 3/24/2007: We have warned of increasing drought and deluge, increasing temperature swings to the extent that the seasons will blend into one another, increasing storm ferocity with hurricanes and tornadoes occurring where previously unknown. This trend has barely started, as the Earth wobble has taken a new turn, just now emerging for those astute enough to be watching the skies, but about to pick up steam. We warned over a year ago of a lean to the left in the Earth, as the Earth's N Pole tries to evade the N Pole of Planet X. What kind of atmospheric swirl do you suppose such a periodic lurch would create? This will at first be blamed on Global Warming, as has been the mode, but how does a slight increase in air temp cause the Sun and constellations to be so far out of position? The weather will soon be the least of your worries. Pet owners mourn in horror as the very foods they have been pampering their pets with prove to be the cause of death. A federal investigation is focusing on wheat gluten as the likely source of contamination that sparked a recall last Friday of 60 million cans and pouches of the suspect food. The ingredient, a protein source, is commonly used as filler. The wet-style pet food was made by Menu Foods, a Mississauga-based company. The recall now covers dog food sold throughout North America under 51 brands and cat food sold under 40 brands, including Iams, Nutro and Eukanuba. The food was sold under both store and major brand labels at Wal-Mart, Kroger, Safeway and other large retailers. Wheat gluten itself wouldn't cause kidney failure, leading FDA investigators to suspect contamination by other substances, including heavy metals like cadmium and lead or fungal toxins. Aflatoxin, a corn fungus, sparked a 2005 dog food recall. The question hangs in the air, could this happen to human food? There have been scares in the US, which the Zetas attributed to distracted workers rather than intentional poisoning, although Bush has cut the inspection budget. The Zetas responded to these concerns last Fall. Question: What do the Zetas say about the poisoning of our food supply recently. First the lettuce incident, then other vegetables, and now we hear that Honeybaked Ham Inc. is recalling 47,000 pounds of turkey and ham. Can we expect a lot more of this? ZetaTalk Response 11/26/2006: Where ecoli is in the gut of every animal, humans included, the outbreaks are excessive lately. This is not a plan to poison the populace, but due to carelessness. It was noted a few years ago, as the Millennium passed, that people were getting distracted, careless, and irritable. They sense, at a deep level, that things are not right with the world, Earth changes, the weather, trembling in the ground, and most of all an apparent casual attitude on the part of the authorities. The media is directed to chirp along with all is well, nothing wrong. Thus the public is secretly enraged, feeling their safety is being overlooked, and sensing a gigantic lie being perpetrated. Some have noticed the Moon or Sun not being in the right place, yet no media comment whatsoever. What does it take to get some truth from the establishment! This is their sense of rage. Distracted workers may make mistakes on the computer or hand out a burger instead of a fish sandwich, and this can be corrected or called to attention. But washing vegetables taken from the field, or putting meat away promptly into the freezer, and especially washing the hands well and cleaning up afterwards, what is the motivation in one distracted by rage? This will all increase, and not abate. But where will this lead? What was the cause of the pet food scare? And what is to keep this same onslaught from happening to human food? ZetaTalk Response 3/24/2007: Food poisoning is not new, and the causes well known by humans who have learned to guard against these occurrences. Botulism, which can grow in improperly canned foods. Various molds on grains that regularly attack livestock if not guarded against by good ventilation and dry storage practices, and affect humans as well. Ergot in Rye. Aspergillus, known to attack the kidneys and liver. E-coli, on the increase due to raising livestock in crowded pens rather than free ranging them, a practice that inhibits the incidence of the fatal version of e-coli. None of this is new. Human food production in the US is under greater scrutiny than the production of pet food, for obvious reasons. Law suits demanding compensation for pain and suffering and loss of cohabitation are likely to be much less costly! So what is a distributor of moldy or contaminated grain to do, given these constraints? Sell to the pet food manufacturers! As food shortages increase, risky food will creep into the food chain, especially if the inspectors are told to look the other way so food can reach the shelves and stop panic in the populace, who will start to become concerned about food shortages. What is to be done? Outside of learning to raise your own food, little can be done by the common man. In any case, the pending pole shift will change the dynamics, eliminating food distribution and food for pets. Most food will be eaten before it can molder and pesticides will be a thing of the past. Check out the new video clips, The Zeta Report, now on the Internet. More to follow! The Zeta Report 1, Mar 21, 2007 - daylight savings time change and its relationship to chemtrails and the anticipation of signs in the sky, the return of the Second Sun.